Covington attended Arizona State University studying advertising and General Business. He then moved to Los Angeles to study Product Design at the world-renowned Art Center, College of Design in 1980. 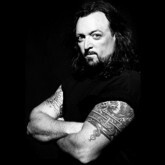 The Art Center is one of the most progressive colleges in Industrial Design, and also lists as one its Alma matter Willie G. Davidson, Director of Styling at Harley-Davidson. In the early 80's Covington purchased his first Harley-Davidson motorcycle. Not completely satisfied with the performance fit or finish of his production model Harley, Covington did a complete tear down and personally customized his machine. 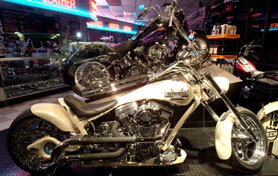 This very motorcycle was chosen to be featured in the "Official Harley-Davidson® Dreamgirls calendar." Soon Covington was busy customizing bikes for friends, and in 1989 he picked up an account building bikes for Thunder Road, an aftermarket shop on the Sunset Strip in Hollywood. To accommodate all the work coming his way, he set up his own shop, Surgical-Steeds®, in Sun Valley, California. The name implies the "SURGICAL precision and cleanliness in details in augmenting the Iron Horse or STEED." While operating out of an industrial complex in California, Covington's bikes became a mainstay in the H-D calendar. With four of the twelve bikes featured in the 1993 issue being customized by Steeds, it soon became obvious that the demand for Steed customized Harleys was going to deserve a full-service retail location. In 1991 the Los Angeles riots broke out, and this was the impetus for the Covington family to relocate back to John's roots in Arizona. A location in Scottsdale, a suburb to the northeast of Phoenix was chosen. The expanded version of Covingtons' retail vision was incorporated in Arizona dubbed Surgical-Steeds Classic American Motorcycles Inc..
John's wife, Deborah, who has a background in Accounting and Administration, came to work at the new Steed facility full time. Having worked as a computer systems analyst and manager for one of the top entertainment management firms in Century City, California, "Breslauer, Jacobson, Rutman and Sherman". Currently Deborah contributes her business and interpersonal skills at Steeds on a daily basis leading the administration of Steed by Patriot. With the growth of the Aftermarket parts industry offering improved components to upgrade Harley-Davidson motorcycles, Surgical-Steeds began to offer complete Steed built bikes with very few O.E.M. Harley parts. In 1994 Surgical-Steeds applied for and received a manufacturers license from the federal government granting Steeds the authority to apply Federal Vehicle Identification Numbers to its brand of American Heavyweight Cruiser Motorcycles. Thus the Steed Musclebike® motorcycle was born in America, with its own Pedigree, #1S9 at the beginning of its VIN, Assigned by the Society of Automotive Engineers (SAE). Over the years, Surgical-Steeds has sourced out quality vendors to supply components for their machines as well as constantly designing proprietary components to improve the Steed motorcycle. The Covington's own several U.S. Registered trademarks to protect their brand including; Steed, Surgical-Steeds, Steed Musclebike, Steed Built to Ride, the Steed Logo silhouette and also claim trademarks to the brands Arabian, Appaloosa, Pegasus, Clydesdale, Thoroughbred, Quarterhorse and Sintaur to identify its models of motorcycles. In 2006, the Covington's sold their rights to the Trademark "Monoglide" to Harley-Davidson, and currently use Monotail to identify the single-shock proprietary chassis, which made its debut on the open road in 1998. Other groundbreaking motorcycle innovations include leading edge digital instrumentation, Steed Behemoth bars with clean internal wiring, a line of one-piece forged billet aluminum wheels and a constantly evolving line of proprietary Steed Brand motorcycle products. With the promise of bringing the Steed Brand national prominence via Patriot's "Global Presence and the financial strength of a public company," in July of 2005 the Covington's entered into an ill-fated alliance with Patriot Motorcycle Corporation. In a deal where we sold select physical assets of our manufacturing operation and granted a license to Patriot for the Steed Brands in exchange for Patriot Stock and the Director or Design and Development position in their company, I surrendered control of the direction of the brand while in Patriots employ. By March of 2006 Patriot's funding ran dry along with any production of any new Steed Brand Motorcycles. The Covington's and their crew stayed on working on future model motorcycle prototypes while Patriot promised additional funding was on the way. By October 2006, an authorized Patriot representative suggested an offer for the Covington's to Purchase back the assets since Patriot could not financially sustain the operations of their "Street Motorcycle Division." In short time, negotiations ceased between Covington and Patriot resulting in a parting of the ways, along with pending litigation initiated by the Covington's, and a prompt liquidation and dismantling of the Scottsdale manufacturing facility before Christmas of '06 by Patriot. The entire family of Steed federally registered brands along intellectual property, including NEW innovative motorcycle designs and products developed post-Patriot remain the property of John Covington and Covington Creations. So here we are starting a new year - 2007. We have a fresh start and clean slate to rebuild the Steed Musclebike brand with renewed conviction, perseverance and tenacity. Keep your eyes posted to this site for all the latest innovations from Covington Creations -- the STEED brand will be celebrating our 20th Anniversary in 2009. It's a long and winding road when you're a WORK IN PROGRESS! Thanks for all your continued support and encouragement.